The map below shows the extent of the county with some of the major towns (don’t use this map as a substitute for the Ordnance Survey:-). The County comprises the three districts of North, East and South Ayrshire (and no, I don’t know what happened to West Ayrshire:-) bounded by the Firth of Clyde. So if you see something in this area then it could appear in the county’s bird report! The range of habitat includes mountain, forest, urban, farmland and coastal. A large number of location reports have been compiled describing the best places to watch birds in the county. 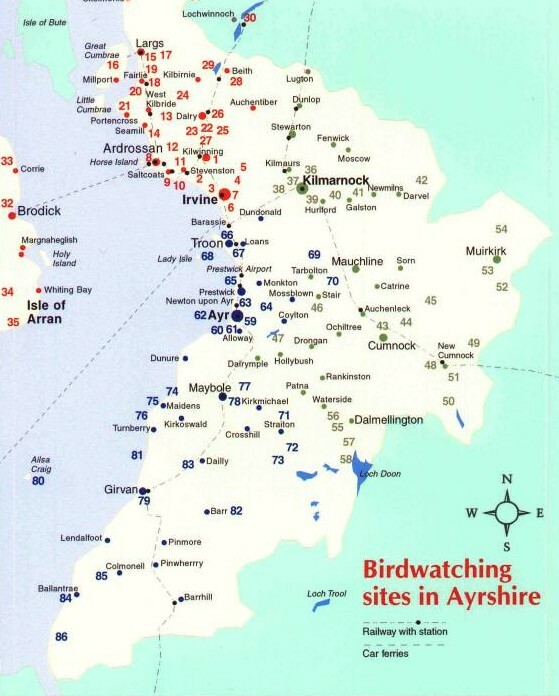 These locations are indicated by numbers on the map and are also used in our Birdwatching in Ayrshire and Arran booklet. This entry was posted in Locations on 02-Oct-2010 .